Plasticity refers to a physiologically measured change that may last for short or long periods of time. 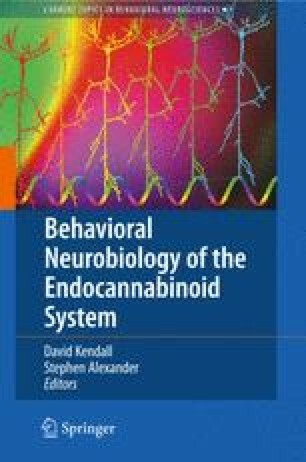 Endocannabinoids (ECBs) are prevalent throughout most of the brain, and modulate synaptic transmission in many ways. This chapter will focus on the roles of ECBs in neural plasticity in the mammalian brain. The topics covered can be divided loosely into two themes: how ECBs regulate synaptic plasticity, and how ECBs’ actions themselves are regulated by neuronal activity. Because ECBs regulate synaptic plasticity, the modifiability of ECB mobilization constitutes a form of “metaplasticity” (as reported by Abraham and Bear (Trends Neurosci 19:126–130, 1996)), i.e., an upstream process that determines the nature and extent of synaptic plasticity. Many of their basic functions are still being discovered, and while there is consensus on large issues, many points of divergence exist as well. This chapter concentrates on developments in the roles of ECBs in synaptic plasticity that have come to light since the major review by Chevaleyre et al. (Annu Rev Neurosci 29:37–76, 2006).